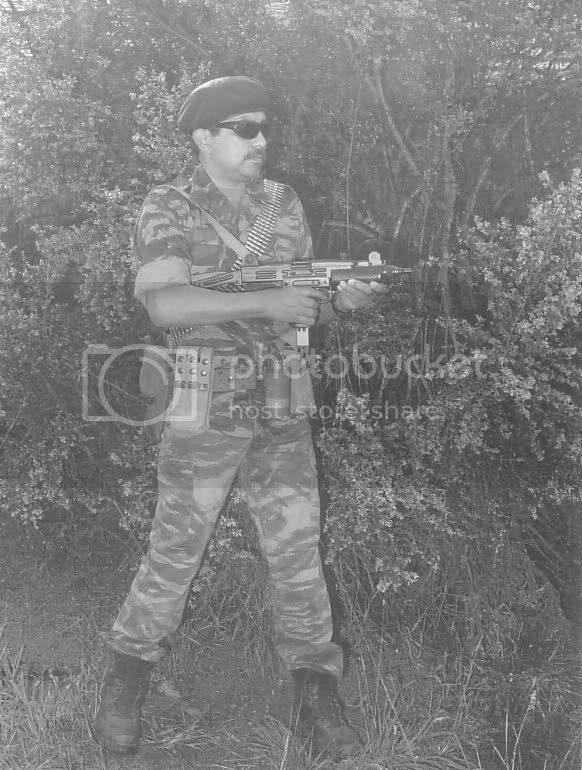 Here are a few pics of our Moro and NPA insurgent impressions, plus early attempts at several other impressions during the late 80's. U.S. troop impressions of the "panama intervention"
Eeeks!.....sorry Captain Rudy. Yes, the Fallschirmjager doesn't belong in the last set of photos. Here are the rest of the "erzats" German ones. Must have been really unique to have those uniforms and gear during that time. What year were these photos taken Ray? Who's the kadre with an AK and blue hat? Were's Manny or your other brothers here? Heheh love it man, I believe that's you Ray, batambata. can you repost the pics sir RayadillO? thanx! Very cool Rudy ;D You've just inspired me to try and come up with a late 1970s Somoza era Nicaraguan National Guard impression. I already have an Israeli kevlar helmet, but i wonder if there is an airsoft G3 rifle out there? When a few CPP-NPA units were "regularizing" in the early to mid-80s, there were a few tentative steps towards adopting a uniform look. This is obvious when one goes through backcopies of National Midweek, particularly during the 1987- ceasefire period. I'm not sure if this ever became official Party policy though. In more recent times, going by the pictures on the CPP-NPA-NDF website, units in Southern Tagalog seem to favor black. Good eye> How about somewhere in Hondurus? It was summer work. What you do not see is first Glock 19x9 in holster. 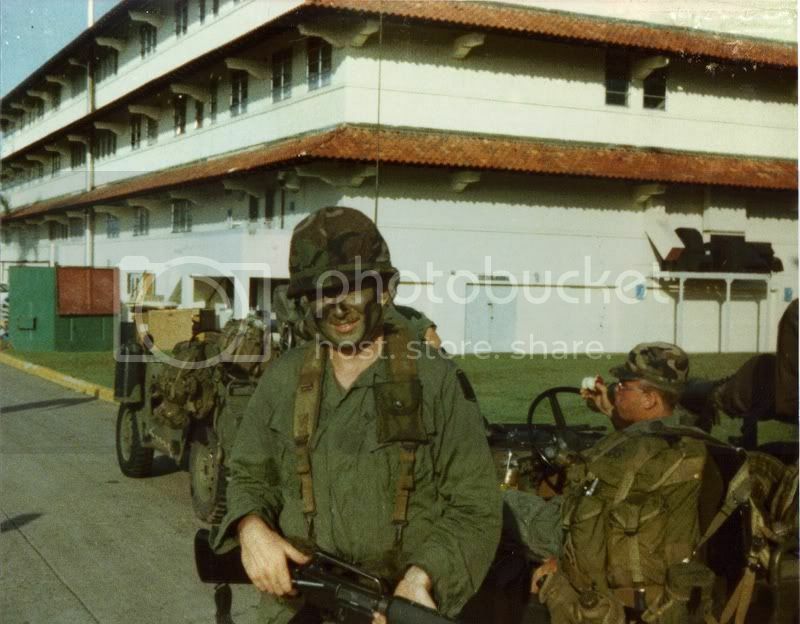 We got to fire weapons taken from that area...they were AK47's in various conditions, FN-FAL's, a really nice SVD and an even nicer M1D that we didn't get to fire. Wow old skool. OD uniform and steel pot helmet. Just like in the movie Stripes. That was 1984. We used to watch the Soviet trawlers go through the canal. We would wonder how much stuff was going to the formentioned area. Those are 3rd pattern jungle fatigues. The stateside units got issued the erdl's. This is what units, that got sent to work in bases up north, would have looked like. I was there when they gave it back to the Panamanians. My brother was a Ranger and taught at the canal. His wife was assistant to the base Chaplin's office and 3 rug rat kids. I might have walked by you in the Zone. I went and visited him from 80-84 when I was traveling South and Central America. I loved seeing the Sun rise in the Caribbean side, then take the train and watch it set on the Pacific. I even saw the Shah when he was on that island no cars can go on.